Tripp Lite's 4.57 m (15-ft.) PVC SVGA/VGA monitor replacement cable features built-in 3.5mm stereo plugs, for extending audio as well video. The mini-coax (RGB) and paired video wire construction delivers superior video signal quality. Nickel plated connectors and gold plated copper contacts ensure excellent conductivity. Double shielding (foil and braid) provides maximum EMI/RFI protection. Both high density DB15 male connectors are molded and have integral strain relief to ensure they last a long time. 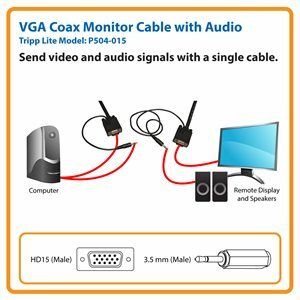 Tripp Lite’s VGA Monitor Cable with Audio and RGB Coax is an easy, inexpensive solution for connecting an XVGA/SVGA/VGA standard monitor and speakers to a computer up to 15 feet away. This cable delivers premium-quality video and stereo audio through a single cable to reduce cable clutter. It’s compatible with both PCs and Macs equipped with a female XVGA/SVGA/VGA port and a 3.5 mm female port. The P504-015 supports resolutions up to 2048 x 1536. The P504-015 is manufactured using top-quality materials. It has mini-coax (RGB) and paired video wire construction for superior signal quality. Nickel-plated HD15 connectors with gold-plated copper contacts ensure excellent conductivity, while double-shielding with foil and braid offers maximum EMI/RFI protection. Molded connectors with strain relief provide durability and long life. This riser-rated (CMR) cable has a flexible PVC jacket for easy installation in tight spaces. For peace of mind, the P504-015 comes backed by a lifetime warranty. It’s manufactured in compliance with strict RoHS specifications, reflecting Tripp Lite’s commitment to environmental responsibility.